The lesser spotted dogfigh is one of the smallest, thnnest sharks that exist. Its back is brownish with dark stains and the first dorsal fin is closer to the tail than to the head. Its maximum size is 1 m and its maximum weight 3 kg. The females form small groups and are joined by the males in spring. Their activity is mainly at night. 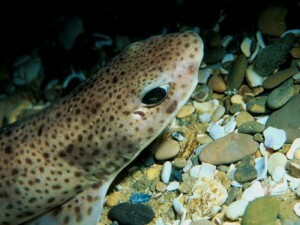 They are carnivores that eat molluscs, small crustaceans and poliquets, and small pelagic fish and fish from the bed. Like all sharks, they have interiuor fertilisation. They are oviparous (96-115 eggs a year). Spawning may occur throughout the year, although it is more frequent between November and July. It lays two eggs at a time in shallow waters, and hatching varies from 5 to 11 months, depending on the water temperature. 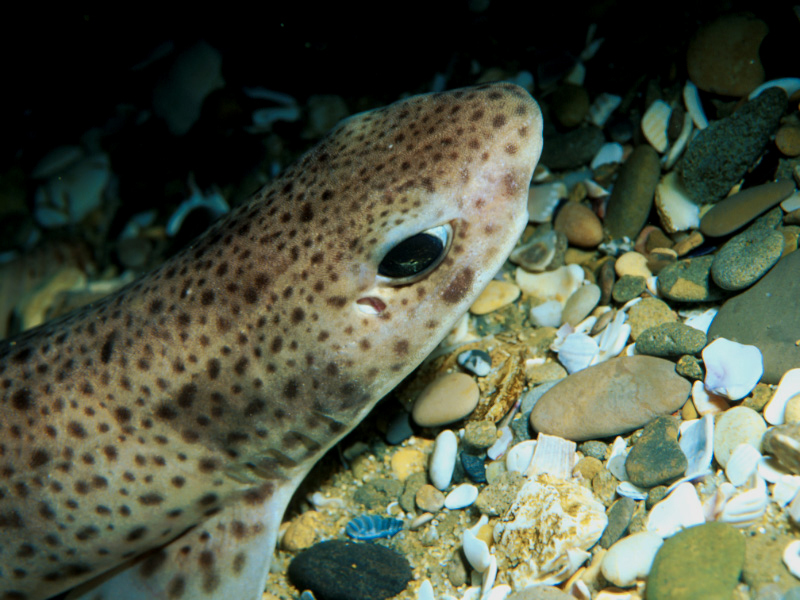 This shark is benthonic (it lives on the bed) and lives from the most surface areas to depths of 200 m and even 500 m.
It is found in the Mediterranean Sea, the eastern Atlantic from Norway to Senegal; in the North Sea and the English Channel. Species not evaluated (according to the red list of threatened species). Its skin is rough, like all sharks, and was previously used as sandpaper to polish wood. The eggs lie in distinctive capsules, which are known as mermaids’ purses, and are normally found on marine coasts and rocky bays.